Part of our traditional Super Bowl spread is homemade soft pretzel bites. In preparation for this year’s Super Bowl I decided to take another look at the recipe and dive into the chemistry of what makes a pretzel a pretzel. Pretzel dough itself is nothing special, and if you just throw it in the oven you will get pretty standard breadsticks. The distinctive taste, color, and crust of the classic pretzel comes from briefly boiling the dough in an alkali wash. The alkali imparts flavor and accelerates the Maillard reaction. The classic Bavarian pretzel uses a solution of sodium hydroxide (NaOH), otherwise known as lye. Yes it is, and using this method requires a good amount of safety equipment, and probably should be left to the experts. Thankfully, there are two alternatives, sodium bicarbonate (baking soda), and sodium carbonate (soda ash, baked soda). 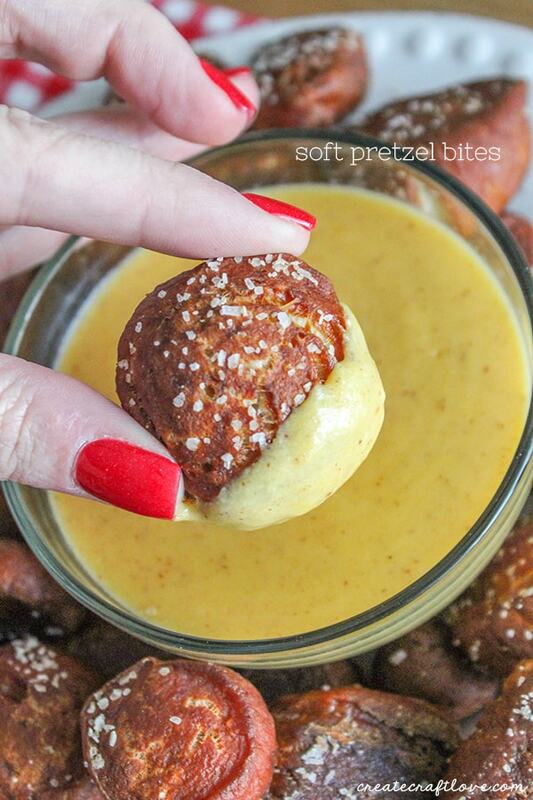 Most recipes call for baking soda, but if you want to up your game and get more pretzel flavor, try sodium carbonate. You won’t find sodium carbonate at the grocery store, but it can easily be made by heating baking soda. As the baking soda heats it releases water and CO2 and you are left with the sodium carbonate. Allow it to cool and place in an airtight container as it will absorb water from the air. Sodium carbonate is mildly caustic, nothing like lye, but it can irritate skin and eyes, so be careful. In a stand mixer bowl, place the warm water and empty the yeast packet into it and mix with a spoon. Mix in the sugar and the butter, and let stand 5 minutes to allow the yeast to activate. Using a dough hook on low speed add in the flour and salt. Increase the mixer speed and knead the dough until it is uniform and pulling away from the bowl. Remove the dough from the mixer and knead into a ball. Lightly oil a bowl with vegetable oil, place the dough ball inside the bowl and cover with plastic wrap. Allow the dough to rise for about an hour. Place the dough on a flat surface, divide into manageable portions and roll out into a long rope. Cut the dough into 1” bites. Bring a liter of water to a boil and carefully mix in the sodium carbonate. If you are using a larger pot, you can scale this up 1:1 to maintain a 10% solution. In batches, boil the dough bites for about a minute, and place on the baking sheet. As the water boils off, add in more to maintain about the same volume you started with. Bake for 15-18 minutes until brown. 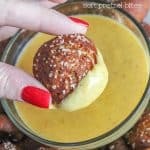 Everyone's favorite snack paired with our cheddar mustard sauce! In a stand mixer bowl, place warm water. Empty yeast packet into the bowl and mix with a spoon. Mix in sugar and butter, let stand for 5 minutes to allow yeast to activate. Place the dough on a flat surface, divide into manageable portions and roll out into a long rope. Cut into 1 inch bites. Bring the liter of water to a boil and carefully mix in the sodium carbonate. If you are using a larger pot, you can scale this up to 1:1 to maintain a 10% solution. Spray baking sheet. In batches, boil the dough bites for about a minute and place on baking sheet. Sprinkle with salt.